I don’t know if I should really call this creation a “salad” – it’s more of a vegetable medley. All I know is that I began with an old recipe that called for asparagus and squash, started adding and subtracting and came up with not only a wonderfully filling but a visually appealing dish. The original recipe called for 400 grams of canned lentils. Canned? NOOOOOO. Not in my kitchen! As an aside, I love to add lentils to soups, salads (just today I put ½ cup or so of plain lentils on top of my arugula salad) and just about anything else that isn’t too weird. They are inexpensive, and they only take 20 minutes to cook. Plus they are high in fiber, iron, protein and minerals! Prepare squash by softening for about five minutes in the microwave (see Squash Ravioli description). Peel, seed and cut into ¾ inch squares. Preheat oven to 400 degrees. Line two rimmed baking trays with parchment paper. Toss the squash and onions with the olive oil, garlic and cumin and place them on the lined tray. Drizzle with the balsamic vinegar. Season with salt and ground pepper. Bake for 30 minutes or until tender. Remove from oven and cool completely. Your kitchen will smell great at this point! Meanwhile, blanch the green beans in an uncovered pot of salted boiling water for a few minutes so they are still green and a bit “crunchy” – just two minutes or so. Remove to a large bowl of ice water and when cooled completely, drain beans on a clean dish cloth. 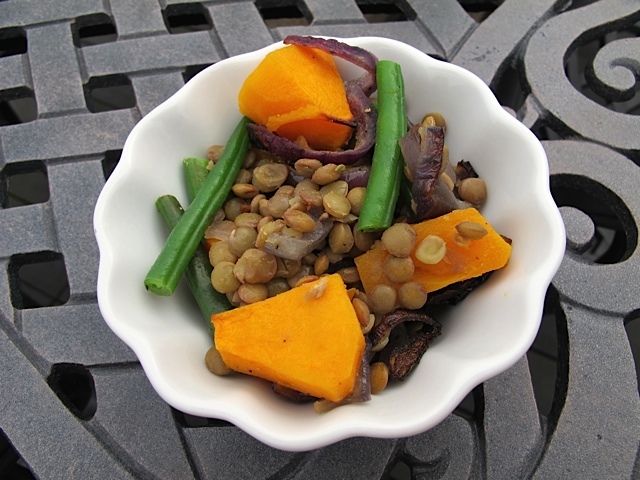 When everything has cooled to room temperature, combine beans, squash, onions and lentils. Store in refrigerator. When ready to eat, bring this to room temperature and drizzle with a mixture of one tablespoon balsamic vinegar, 1 ½ tablespoons good olive oil and a pinch of dry mustard. Alternately, try adding some thinned tehina sauce to the salad along with toasted sesame seeds to top – a totally different but equally delicious version. This entry was posted in Salads & Dressings, Side Dish, Vegetables and tagged Butternut Squash, Lentil & Squash Fall Salad, Lentils. Bookmark the permalink.